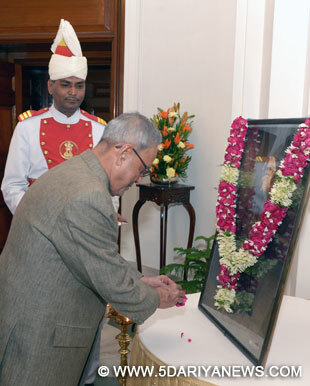 The President,Pranab Mukherjee paying floral tributes at the portrait of Gurudev Rabindranath Tagore on his Birth Anniversary, at Rashtrapati Bhavan, in New Delhi on May 09, 2014. President Pranab Mukherjee Friday paid floral tributes to Rabindranath Tagore on the occasion of his 153rd birth anniversary, at Rashtrapati Bhavan here.Other office bearers and staff of Rashtrapati Bhavan were also present on the occasion.In 1913, Tagore became the first Indian to win the Nobel Prize in Literature. The Nobel laureate is the author of the country's national anthem.